Mountain West optical was founded in 1984 by Terry & Shirlene Tranmer. Terry started in the optical business in 1972, working with a true craftsman, who trained him in the art of making eyewear. Mountain West Optical is all about service. We measure success as being able to customize eyewear for each individual. We know that everyone is different, and that eyewear needs to be custom made for each individual. Knowing a client’s needs, their personality, and occupation goes a long way toward the proper eyewear. The staff of Mountain West Optical are trained and licensed opticians who have been taught the true art of making and fitting fine eyewear. We only use the finest quality materials and we always carry a large selection of frames and lens materials. Our knowledge of these products allows us to assist you in your every optical need. Our integrity, knowledge, selection of product, and commitment to service gives us the edge in customer satisfaction. 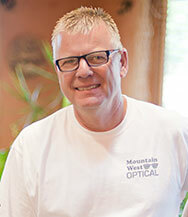 Terry is the Chief Executive Officer and a Co-Owner of Mountain West Optical. He is a Master Optician, and as such he is skilled as a Technician, Dispensing Optician, and in ophthalmic instrument repairs. He jokes that he is also a janitor and the parking lot attendant. He and his wife Shirlene co-founded the business in 1984. Over the past 35 years he has been dedicated to becoming a Master Craftsman of refractive optics. He is recognized as a trusted and wise authority in the industry. Terry enjoys interviewing each client, and then ascertaining what options are best suited to their individual needs. He has a passion for creating your custom eyewear. He also enjoys crafting ballistic eyewear for Law Enforcement, Fire Fighters, Military and Sport Shooters. He has surrounded himself with a team of skilled professionals that share his vision of quality and service. He has mentored each in the art and the skill of the trade. Outside of work he is an outdoor enthusiast. He enjoys all things that are “Jeep” related. He also enjoys shooting, RV’s and traveling with his family and friends. He is happiest when serving others, and loves those whom he works with. Shirlene is The Chief Financial Officer at mountain West Optical. She is also a Co-Owner. For the over the past three decades she has been able to work side by side with her husband on a daily basis and at the end of the day still be able to go home together and say that they still love each other. She stays busy overseeing all financial and accounting functions within the business. She credits her humble start to a great high school teacher who taught her how to apply and interview for her first job, in an office at Sears & Roebucks. Over the years she has always worked hard, she is accurate, honest, and dependable. She is passionate about helping other people and feels her work environment is a natural fit. At work she believes in making thing fun. She enjoys being outdoors, going for walks, traveling, random road trips, and on special occasions laying around on the beaches in Hawaii. She also loves being a wife, mother, and grandmother. Dr. Fish graduated with distinction from Pacific University College of Optometry. Prior to optometry school, he received a Bachelor’s of Science degree in Zoology from Idaho State University. 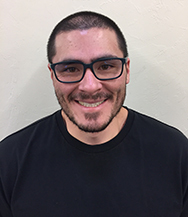 He enjoys working in the relaxed atmosphere at Mountain West Optical. He is careful with refractions, and will take extra time with each individual to give them the best care possible. Dr. Fish treats a variety of eye diseases, fits contact lenses, and can care for the entire family. He is a good listener and enjoys challenging contact lens fittings. Away from the office he enjoys spending time with family, being outdoors and mountain biking. 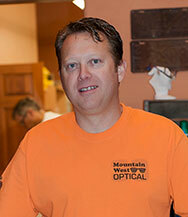 Dan is both an Optician and the General Manager of Mountain West Optical. 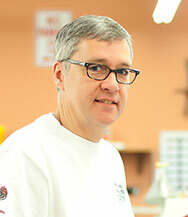 Over the past 25 years he has continued to hone his skills in an effort to better assist you with your optical needs. He is skilled in the procurement, production, customization, fitting, and the repair of your unique eyewear. He also has responsibility and oversight for quality assurance. Dan enjoys interacting and assisting our clientele. Away from work Dan is fascinated by all things that have engines. He has great appreciation for “Hot Rods”, and various types of sports cars. Lisa is an Insurance Specialist responsible for submitting all insurance claims. She also is a purchasing agent who procures our prescription contact lenses. In her free time she loves to help with our accounts receivable, and assist at the front desk when called upon. Lisa is a very detail oriented person. 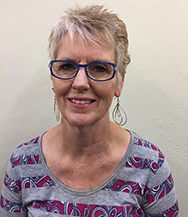 She has worked in several professional offices prior and has been applying her skills at Mountain West Optical for the last 15+ years. Outside of work she enjoys spending time with family, shooting, reading, knitting and bowling. 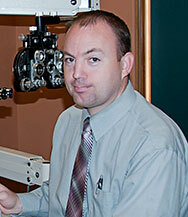 Brian is an Optician who has marketing, sales, and management experience and responsibilities. His formal education was at Idaho State University in Business Administration with an emphasis in Marketing. He is a Twin Falls native and began his education at the College of Southern Idaho. At Mountain West Optical he most enjoys working with the public. He has strong communication skills, he is compassionate, honest, and both a creative and analytical thinker. He is detail oriented and committed to providing each customer with exceptional service. His personal interest include; spending time with family, learning new things, and being outdoors. Kent is an Optician who loves a challenge. He was born in California but raised in Southern Idaho. He is skilled in the customization of your specialized eyewear. He is the go too man for prescription scuba masks, ski goggles and high wrap sunglasses. If you are looking for something unique, he will help you explore all the options and choose the best ones available for you individual needs. He enjoys working with his hands and is talented in fitting your glasses comfortably. 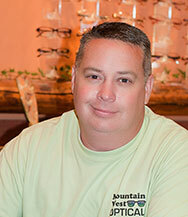 He has worked at Mountain West Optical for more than 20 years. He enjoys meeting and interacting with variety of people. 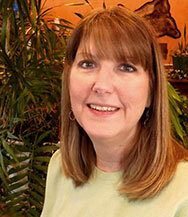 Laurie is a Receptionist who is responsible for positive first impressions. As such she functions as a “Traffic Cop” who directs and manages the flow of business. She is very organized and skilled at multi-tasking. 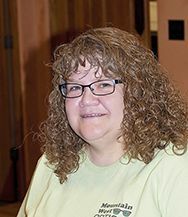 On a daily basis she assists in scheduling appointments, accessing insurance benefits, filing, cashiering, and connects the public with the appropriate associates at Mountain West Optical. Laurie has a friendly and bubbly personality. She enjoys joking with her coworkers, likes her bosses and is happy about working in a relaxed environment. She loves visiting the Sawtooth Mountains in Stanley Idaho, cross stitching, knitting, reading, rafting and swimming. She is an animal lover and also enjoys camping. Myrna is both a Wholesale Account Specialist and a Purchasing Agent. as such she serves as a Professional Liaison with many optical frame and lens suppliers. She maintains tight inventory control standards, and strives to minimize spoilage. She has responsibilities for both shipping and receiving product. She likes to stay busy and is always interested in learning more. She started her career with Mountain West Optical as a receptionist working at the front desk. She likes to help other people. She is knowledgeable in her area of responsibility, and very dependable. She is also a jokester at heart. One of her favorite past times is making other people smile. Stephanie is an adventurous and courageous Optician who has returned to Mountain West Optical after spending five bone chilling years living in North Dakota. 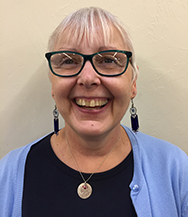 She is very glad to be back in the wonderful state of Idaho and loves “The Great North West -United States.” Stephanie strives to help you make wise and prudent choices by custom matching your eyewear to your unique life style. She will work hard to both anticipate and exceed your expectations or needs. In her free time she enjoys knitting, reading, going for walks, and participating in research quests with her daughter who is an upcoming new Author. She also greatly values family and loves to spend precious time with her children, grandchildren and husband. 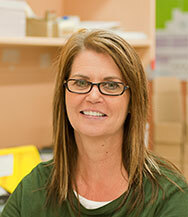 As an Optician, Shelley has accumulated over 25 years of valuable optical experiences. She enjoys helping others explore custom eyewear that is expressive, fashionable and fun to wear. She will try hard to help the timid person break free of the old predictable “humdrum” or boring styles of years past. She loves to help people discover shapes and colors that will make positive great impressions in your diverse social circles. In 2016 she relocated to Southern Idaho from Oregon to spend more quality time with her daughter, and her family. When not at work Shelley loves to travel with her husband and make special memories with her grandkids. Kelly is an easy going, and hard working person. He works as an Opticial Lab Technician. He is highly skilled in both digital and traditional lens surfacing, coating, and polishing. He has responsibilities for prescription quality assurance, equipment calibration and maintenance. He has a high aptitude for problem solving and is eager to learn new things while constantly working as a team player. Away from work Kelly loves being a father, enjoys the outdoors. Likes to fish, camp and spend time with family and friends.